Michigan has a LOT of casinos – 26 total, I believe – and for those looking for a two-day, northern Michigan casino tour, there’s a very easy, fun and scenic route. We made our journey via a tour company and bus, which, for $115, provided travel from Southeastern Michigan to Soaring Eagle Casino in mid-state Midland, then on to Kewadin Casino in St. Ignace in Michigan’s Upper Peninsula, overnight accommodations in Mackinaw City and then off to Odawa Casino in Petoskey and Turtle Creek Casino in Williamsburg near Traverse City before heading back to the Detroit area. It was a whirlwind, but very fun, and each casino provided some level of free play or comps for the group, which made the cost negligible, other than personal gambling cash. Doing this by tour bus (via the Chelsea Senior Center and Travel Treasures and Tours) was clearly the best deal, but traveling the route by car would offer more flexibility for dining, sightseeing, shopping and the ability to add a night or two, or three, and make it a longer vacation. Leaving Chelsea at 7:45 a.m., we did an on-route McDonald’s breakfast stop, which was surprisingly efficient, then landed for a four-hour stay at Soaring Eagle, where we each received $20 in gambling credits and a $5 food voucher. Soaring Eagle is a big (210,000 square feet), somewhat smoky casino, which has a large non-smoking area located in the back, farthest from the entry doors, which in itself, seems illogical. Nonetheless, the casino offers an excellent variety of gaming options, including a poker room, and generally has reasonable slot payouts and ‘certified hot’ slots or gaming sections, which claim higher payout ratios. One thing I really like about Soaring Eagle is its posted winner pictures with payouts, which provide evidence that people really can get lucky and win some big cash there. I also like that there are lots of 2-, 5- and 25-cent slot options, not just a sea of penny machines with 30, 40 or 50-cent minimum bets. We had lunch at the casino’s Legends Diner, a black, white and red retro-themed restaurant, which was pleasant, but a bit chilly – bring a sweater. I ordered the buffalo chicken salad, which was ‘over-buffaloed’ and too spicy for my tastes, but my sister enjoyed her grilled cheese and milkshake a lot. 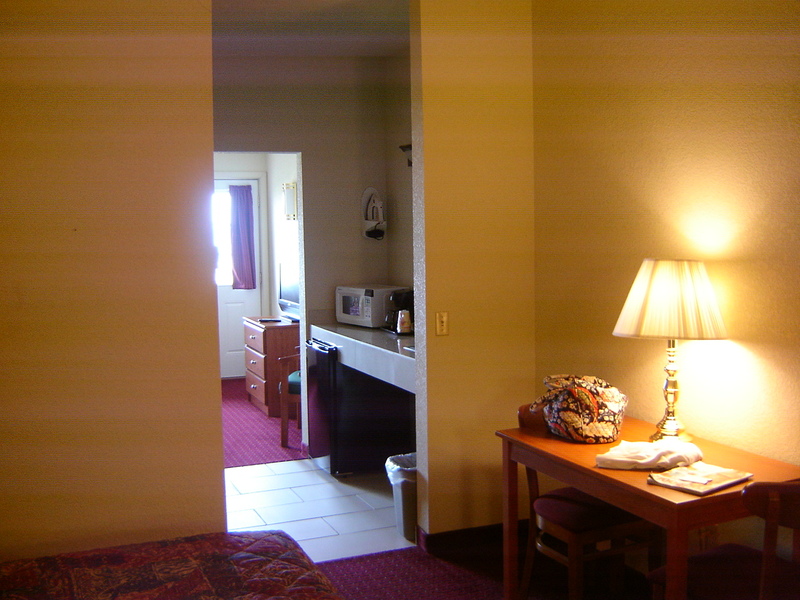 Next stop was Mackinaw City, where we checked into the Mackinaw Beach and Bay Inn and Suites. 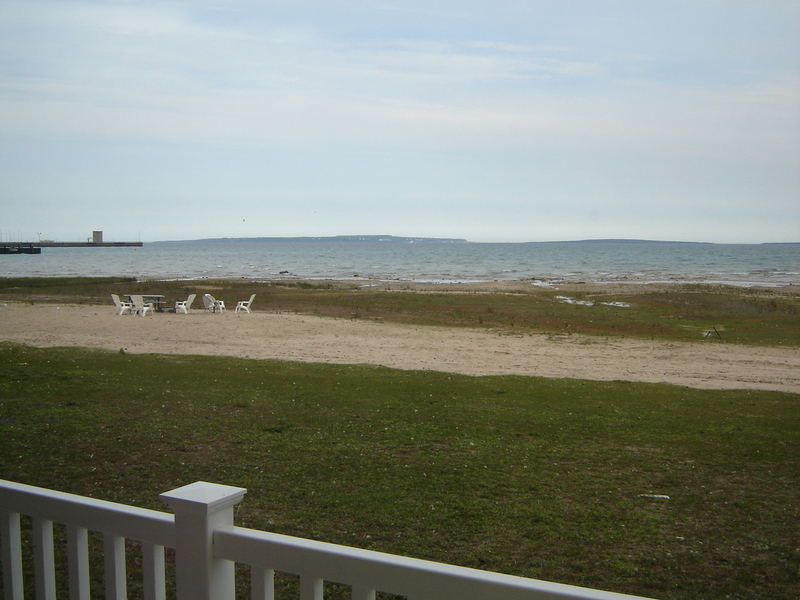 Located right on the Straits of Mackinac, fish flies were abundant at that time of year, the beach is undeveloped (which is how it should be), the free-breakfast room was too small and unattractive, but the rooms were delightful! Big and spacious, the bed areas were separated by the bathroom and galley kitchen. Each had its own TV and one area had couch, table and chairs, the other had the straits view and a balcony porch. Clean, comfortable and affording privacy to the roommates, it wasn’t fancy, but truly was a great place to stay. That evening, we crossed the beautiful Mackinac Bridge to Kewadin Casino, an off-the-beaten-path place on the outskirts of town, yet tucked near the shoreline, with a fantastic patio view of the water. 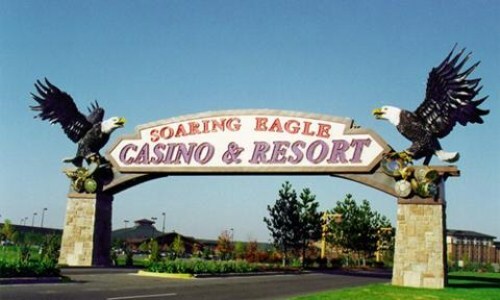 By contrast to Soaring Eagle, Kewadin is relatively small (only 800 slots, plus table games) and is well ventilated. I didn’t notice if there is a non-smoking area. There, the comps were generous, and included $10 cash, as well as a $10 gambling credit and $5 food credit. Free play was limited to specific machines, so that was a bit annoying, but overall, I like Kewadin. I found some different slots, like a Sherlock Holmes game, that allowed you to keep reels and buy others and progressively ‘solve’ the mystery. Now, to me that’s a bit more ‘intelligent’ gaming and fun – even if it did eat up extra money! Kewadin would benefit from a nicer, casual eat-in area, but overall, I liked the feel of the casino. I didn’t win a lot, but I didn’t lose either, and the patio view at sunset is nothing short of spectacular. The next day, our bus traveled along U.S.-31 through some scenic areas and small towns, including Petoskey, to Odawa Casino. There, we received a $10 gambling credit, with an option to earn $5 more, a $5-10 food credit (I don’t remember.) and a bottle of water. 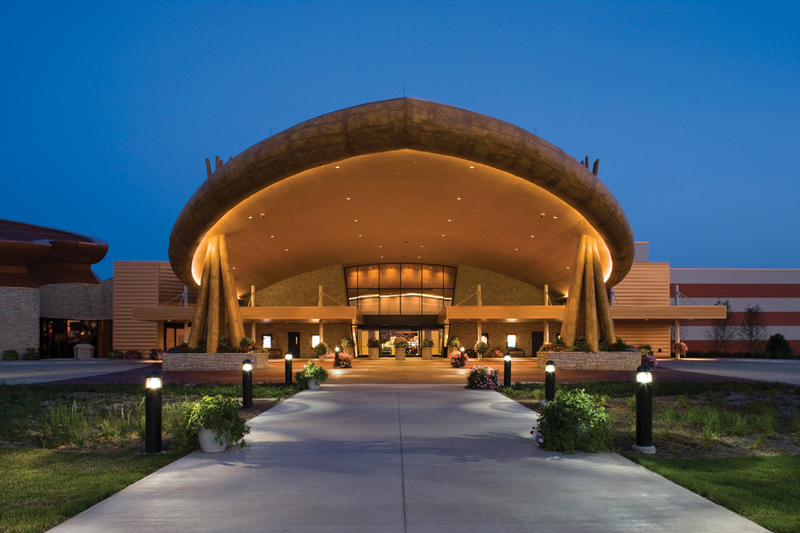 Odawa is beautifully designed with its massive wooden arch entry, and it feels spacious and airy. 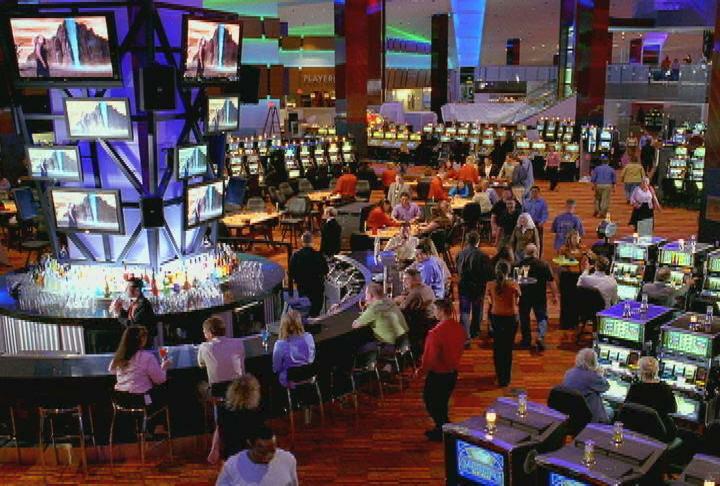 At 50,000 square feet, it has 1,300 slots, table games, a non-smoking area and a poker room. Generally, the payouts seemed a bit skimpy, although my sister, Kathy, found some slots that simply delighted her and left her in the green – small green, but at least on the plus side. I lost consistently, so was somewhat underwhelmed. Using our food credit, we had some delicious wrap sandwiches before leaving, however. Our final stop was Turtle Creek Casino in Williamsburg. Once near the top of my favorites list, Turtle Creek falls far from that list these days. The least generous with comps for our group – $10 and a $2 food credit – earning points for additional comp dollars or free play required a LOT of gambling dollars. Although there are table games and a poker room, the mix of slots has become less diverse and less fun over the years, offering more penny slots with big minimum bets, and the payouts are, in general, subpar. So Turtle Creek, despite its lovely urban design, high ceilings and friendly staff, seems only too happy to take your money and leave you flat. 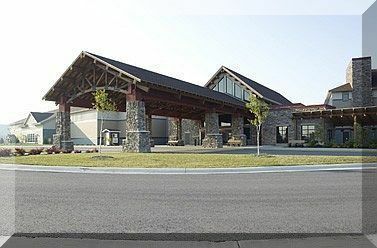 Of all four casinos, I’d say you could skip this one and maybe find another for your last stop – maybe Little River or Saganing, or just stop in if you’ve never been there, and see what you think. I’d like to see Turtle Creek re-invent itself or revive its start-up formula to bring back the fun. Until then, you may be far more satisfied being at the bar, enjoying a couple of happy-hour drinks, than feeding your money to the hungry slots. Nonetheless, our four-casino trek was a fun adventure. We returned to Southeast Michigan after dark, a little after 9 p.m. I think, but early enough to be energized for the drive from the bus stop to our homes, and ready to do it again this summer! Enstrom’s for the Best Almond Toffee EVER!